We hope you enjoyed AHR Expo 2018 as much as we did. It was great to see both existing and new customers. Our booth generated a lot of interest, especially with our fun new DIY product, the BASpi I/O board, which is a 12-point expansion board for the popular Raspberry Pi. When you use the BASpi Raspberry Pi image, along with the BASpi, your Raspberry Pi becomes a Sedona controller with 6 configurable inputs and 6 relay outputs and can communicate over BACnet/IP. It is great for BAS training or home automation projects. The BASpi is part of our broader vision for open control. Our BAScontrol series is leading the way in open control, thanks to its use of open source tools and an open source programming language called Sedona. 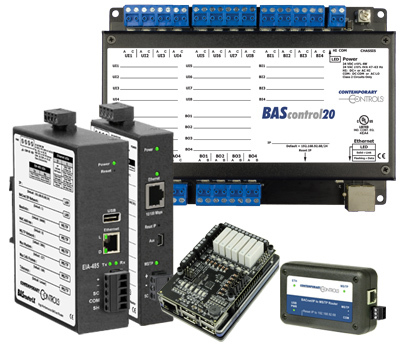 Using a BAScontroller and our free programming tools, system integrators are able to create custom applications using drag and drop programming. Our popular BASrouters received a lot of attention because we are rolling up enhanced diagnostics for both the Portable BASrouter and the DIN-rail mounted BASrouter. We have more information about the portable BASrouter in this newsletter, and we'll be sending out details about the enhanced BASrouter later this year. We also showcased our new IP routers and remote access solutions. The new EIGR Gigabit IP Router and our RemoteVPN service is all you need for secure remote access, saving you time and eliminating the need to go to the site.